This high end boutique hotel welcomes holiday and business travellers from around the world on a daily basis. 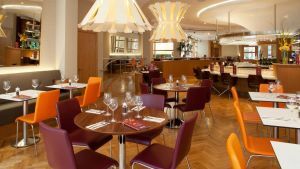 Set in the heart of Dublin city centre, this hotel is ideally located for exploring the sights of Dublin or attending business meetings in the heart of the city. The hotel offers a number of facilities and services including a concierge service, elevator and 24 hour reception desk. There is internet access available enabling you to stay in touch with family, friends and colleagues back home and the fitness centre is available to all guests during your stay. Zaragoza is a Spanish restaurant in the heart of the city and a must if you’re looking for a delightful Mediterranean tapas menu combined with Irish hospitality. The restaurant offers modern cuisine, an extensive wine list and superior customer service. The Bull and Castle is a pub with a difference. This very popular pub is also a microbrewery and offers a host of local beers and other drinks. There is an interesting mix of people that visit this popular pub and it is a great and welcoming space to enjoy a night on the town. If you’re travelling as a family and your youngest is over seven years old, you can spend a day at the Zipit Forest Adventure experience. This adventure park is located in Tibradden Woods and gives you the chance to swing through trees, wander down walking trails and enjoy zip lines, rope bridges and climbing walls. The minimum height to take part in the activities is one metre high and the youngest age is seven. Surprise your loved one with a romantic helicopter ride over the city of Dublin. Tour sof the city centre are reasonably prices and offer a unique way to see the sights and soak up the beauty of this magnificent area. Aras an Uachtarain is a must to anyone looking to explore the culture and sights of Dublin. This is the residents of the President and is only open on Saturdays. You can only explore this residence with a knowledgeable tour guide, but it is well worth the effort. Head to the Designer Mart at Cow’s Lane where you can explore all the handmade items available at this outdoor market every Saturday from 10am. All the items are handmade from decorative gifts to fashion and more.